Over 1.8 Million Stents Implanted per Year in the U.S.
iData Research, a leading international market research and consulting firm, has published results from their latest cardiovascular research revealing that there are over 1.8 million stents implanted per year in the United States. Approximately 965,000 of these can be attributed to the implantation of coronary stents, whereas the remaining, pertain to peripheral vascular stents. Coronary stents are implanted through percutaneous coronary intervention (PCI) procedures. Unit sales growth for the total coronary stent market is highly correlated with the annual PCI procedure volume, and any significant changes will exhibit a direct effect on sales volume. In the past, over-stenting was scrutinized heavily, with numerous studies estimating that approximately 30% of coronary stenting procedures performed are unnecessary. As a result, the average number of stents implanted per year for PTCA procedures experienced declines as the market adjusted to the newly-presented clinical evidence. As of 2018, there are four types of stents used for coronary applications: bare metal (BMS), drug eluting (DES), covered, and bifurcated. Among these, BMS and DES make up the largest share of the market. Bare-metal stents consist of a wire mesh that is designed to expand and keep the lumen from closing again. BMS were introduced in 1994 by Johnson & Johnson, and within a few years, millions of these devices were being placed worldwide. Because a minimally-invasive procedure such as an angioplasty was faster, easier to perform, safer and less expensive than a coronary artery bypass grafting (CABG) procedure, far more patients could be treated than prior to stent introduction. After a few years of use, it was found that bare-metal stents, while effective at dilating arteries, were associated with a substantial risk of restenosis, where the arterial wall would heal over the stent and occlude the artery again. 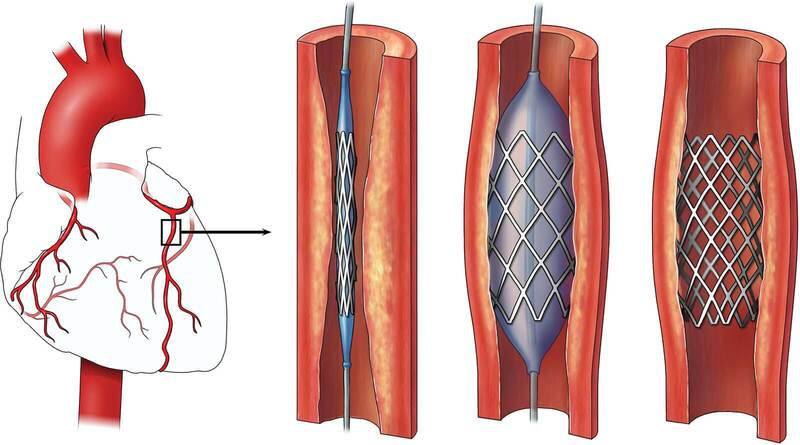 To counter the risk of restenosis, drug-eluting stents (DES) were developed. These stents are coated with a polymer, which contains a drug that promotes healing and reduces the rate of restenosis. Also, in recent years, many companies have been researching new stent designs in response to concerns about thrombosis caused by the long-term implantation of a device. In January 2011, Abbott announced the European approval of Absorb, the world’s first drug-eluting bioresorbable vascular scaffold (BVS) for coronary artery disease. Absorb™ was approved by the FDA in 2016, but was later removed from the global market. Nevertheless, there has been continual development in this market, with several new innovations awaiting approval or in clinical trials. Despite previous issues regarding over-stenting and restenosis risk, coronary procedure fluctuation has recently stabilized and is expected to see low single-digit growth through 2024, according to iData Research. Peripheral vascular stents are commonly used as complementary devices during conventional percutaneous transluminal angioplasty (PTA) balloon catheterization in procedures used to treat peripheral arterial disease (PAD). The U.S. market for peripheral stents comprises bare-metal, covered and drug-eluting stents. The value of the bare-metal stent segment exceeded the combined value of the covered and drug-eluting stent markets in 2017. However, the covered and drug-eluting stent segments are forecasted to grow more rapidly than the bare-metal stent segment. Overall, both the market for peripheral stents and the number of peripheral stent placement procedures performed will continue to grow, due to improvements in technology and the increasing rate of PAD diagnosis. These factors allow stents to be used in a wide array of procedures. As a result, unit sales in this market are expected to rise at a moderate rate. For more on this cardiac stents research, the U.S. Market Report Suite for Interventional Cardiology Devices and U.S. Market Report Suite for Peripheral Vascular Devices provide comprehensive reports on units sold, market values, average selling prices, procedure volumes, forecasts, as well as detailed competitive market shares and analysis of all major competitors. iData’s suite of reports on this subject covers the United States, Europe (15 countries), Japan and three countries in Latin America – Argentina, Brazil, and Mexico.